This day 21 years ago Mr Margie and I got married in Antwerp. It was a chilly morning and about twenty five of our family and friends were there to witness the occassion. Mr Margie swept his hair back in a pony tail, wore his grandfathers coat with white shoes and I wore a floral dress purchased the day before, I was seven months pregnant on Leiny. Mel wore an Oilily dungarees, handknitted jumper (I finished it the week before) and stole the show with her blond hair, blue eyes and cute smile. I woke up this morning to discover that I have been awarded the Christmas Spirit Award by Sharon at ManaMoon. I am honoured Sharon to be included in your recipient list. Thank you very much. Well I have to let you know that this time last week I was a right Grinch, did not feel a bit like celebrating the festive season, was even considering cancelling it. I have Leiny and Mr Margie and all of you in blogland to thank for putting the Christmas spirit back in Margie. for her art, books, devotion,inspiration, bringing people together and reminding us about Pink saturdays. A very Happy New Year and may 2009 be the best year yet. 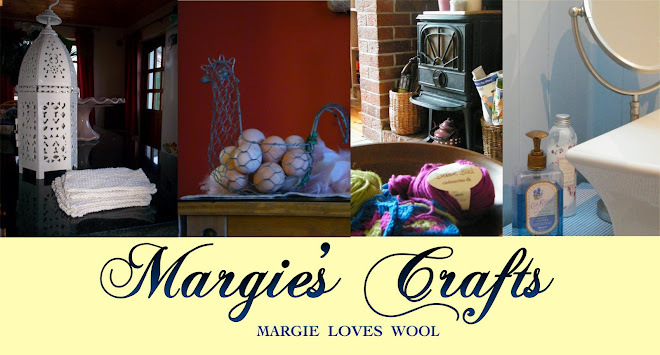 Thank you to each and everyone of you for inspiring me through my visits to your blogs and also for visiting Margie's Crafts in 2008 and leaving all your lovely comments. Wishing you all creativity and inspiration in the future. Leiny and I finished making the New Years cards and got them in the post just before Christmas. Christmas style books are a great inspiration for home decorating over the festive season. These two are my favourite. A Nantucket Christmas by Leslie Lindsey and Ruby & Begonia's Christmas Style by Sara Toliver and Jo Packham. Leiny and I put the garland across the granite pillars in the kitchen and put a pot of gluhwein on the stove. The beds all had a festive makeover too. New covers and a gingham heart add a touch of cozy warmth, an inviting space to rest after all the cleaning and cooking. The stove in the living room is really the heart of our home and Mr. Margie spent some time chopping the firewood for the holidays. A choir of Dickensian Knitted mice spread some festive cheer. I knit these little mice about twelve years ago and each year they have pride of place among the decorations. Mr. Margie, Leiny and I went up to the Christmas tree farm yesterday and picked up two Nordmann Firs, the smell in the house is enchanting. Jacoline (Lien) at Lovely Living set me a challenge when she wondered what was in my bag, her own pretty bag was full of practical and special items. I have to admit to being bag obsessed (a true bag lady). All my family and friends give me bags as gifts. I collect all types of bags, I can never have enough bags and sometimes I make bags. This is my new Cath Kidston bag, a Christmas gift from Mel (my daughter) at Mel's Living. Inside my new bag is my old Irish handmade handbag (yes a bag in a bag), my purse (purchased in Boston), Burts Bees lip salve, two packs of Cath Kidston tissues, sunglasses, tin of mints, work keys with memory stick, my Land Rover keys, mobile phone, two pens, Ulster Weavers shopping bag, which Lein (my daughter) at Just a Minute gave me as a gift this summer (another bag in a bag), umberella, wool gloves and Cath Kidston passport wallet. In passing on the challenge I am curious to know what Vicki at French Essence has in her bag, I wonder if she would like to show us. I am also the proud recipient of yet two more Awards in the last few weeks, Sharon (Thank you very much) at Manamoon gave me a very special award "The Spreader of Love Award" I am delighted to receive it. Sharon and her husband work together to create exquisite jewellery. Very special, modern and classy pieces. Visit her blog and her new website where you can see what I mean. I truly believe that love is at the core of our beings, and that a little time spent sharing love or sending love is time very well spent indeed. I would like to award Beachy at the Whispering Poppies with it as she hosted a wonderful Home Sweet Home Holiday Blog Party and Giveaway last friday, complete with music, stories, memories and inspiration, a great recipe for spreading love in my book. Thank you very much Beachy. I also received a "Wow I love your blog" award from Veronica (Thank you very much) at Ulliga Gulliga Saker I am pleased to accept this award. Veronica's blog is full of her felt work,knitting,ideas and creativity which are amazing. Call by her blog,and you are sure to be inspired, her work is inspiring. Everyone on my blog roll can consider themselves awarded this one, as I love all of your blogs. 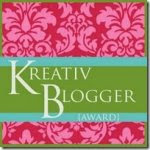 I received the Kreativ Blogger Award a few weeks ago and awarded it to bloggers who were working hard at Christmas Fairs. I have two more recipients for this award. Lein at Just A Minute, who had a sale at College and Vale at Les Cotrions who had a get together and sale with some of her friends. Beachy at Whispering Poppies is hosting a Home Sweet Home Holiday Blog Party and Giveaway. Head on over and look at the great photos full of Beachy's Christmas Cheer and dont forget to join in the fun, there is great Christmas music and lots of people linking up on the Mr. Linky. Two weeks ago we had our family Christmas celebrations as Mel and her fiance Chris will spend Christmas and New Year with Chris's family in Connecticut. Our first ever Christmas apart. So we set about making the best of it and got the tree up on December 1st. Mel put all her decorations up and we had a Christmas dinner with all the trimmings. Mel, Lein and I made our own wrapping paper using wallpaper lining, stamps, glitter, sequins and ribbons. A special time for me, crafting with my two daughters. It is not often we all get to be together. I finished Leiny's cardigan in time for our family pre Christmas Christmas and she was so happy to receive it. Last weekend I went to Vienna with 34 people who I work with. Thomas, a work colleague, and husband of my dear friend Ana at Boladeberlin had lived there for a number of months a few years ago, knew his way around the city and our first stop was a wool shop where we bought german wool for socks and needles for Ana and Leiny (who has begun using them already) at Just A Minute. I think Leiny's recent postings, particularly the one of the Christmas Fair, are fantastic and I want to award her the Kreativ Blogger Award, in keeping with the Fairs theme. a visit to Hotel Sacher for hot chocolate, a trip to Schonbrunn Palace on the sunday morning , a quick visit to the Spanish riding school, a horse drawn carriage tour of the city at dusk, and a spot of shopping at the Christmas markets We still had some time left over for dinner on both evenings, lunch at the Opera house on sunday and a full blown sing song with another group from Donegal on saturday evening. It seemed like we were more than two days there. The nine hours sleep I got over two days left me pretty tired on the monday, when I was back at work. The next post will inlcude a challenge I received from Jacoline (Lien)at Lovely Living and an award I received from Sharon at Mana Moon. Dont forget to join Beachy at The Whispering Poppies for a Home Sweet Home Holiday Blog party on December 12th, sounds like it is going to be a lot of fun. Mel has been spoiling me buying me all my favourite treats and taking me to some lovely shops and thrift stores. Leiny's pre Christmas gift is almost finished. It is made with Japanese Noro wool and is one of the Noro patterns also. It was late night shopping in Henley last night and I was so happy to see this Morris Minor Traveller (like my own one) parked up outside the Bell bookshop all dressed up for the festive season. I had lots of inspiration for my own Christmas gifts and crafts. Morris will also feature this year. I received a Kreativ Blogger award from Beachy(I really appreciate it, thank you for thinking of me) at The Whispering Poppies and it made me so happy, I was really touched by the lovely things she posted about me. 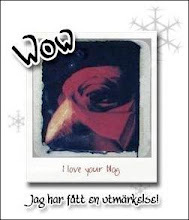 Please visit her blog and if you are inclined participate in the Holiday fun on December 12th. I know I am looking forward to it, what a truly inspired idea. I checked out some of my favourite blogs and saw that two people had been working very hard at Fairs, so I passed on the award to Michele at Cowboys and Custard who is so creative I am always inspired by her work and a little in awe of her energy. Her cards, pocket mirrors and skill at photographing all her wares are amazing and well worth a visit. 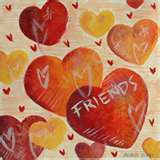 Stephanie at My Calico Heart has been working very hard also for a Fair, I hope it is a total success. I used to do the Fairs a few years ago and know the effort and energy that goes into preparing, finishing, packing, unpacking,then meeting all the buyers, other sellers and then packing and unpacking...so much work. Well done. I am visiting Mel this week enjoying spending time with her and doing some knitting. She has just started a blog too. Give her a visit if you have some time. Leiny also has a new post up of her college work, it is very inspiring. I am very proud of both of them. In preparation for the coming festive season pop over to Karen's blog A Scrapbook of Inspiration for the Christmas Fair where you are sure to find all your shopping needs and lots more fun besides. Mel gets into the festive mood wearing a traditional Bavarian outfit. Leiny prepared goodies and treats for the drinks and snacks evening with all the family in Ireland, we had visitors over from America, Portugal, France and England during the holidays. Then we (six of us went to Belgium for a few days). Mr.Margie was glad to be in the place of his birth, skating at the Ice Rink in the centre of Antwerp. I did a spot of shopping at the new shopping centre while the skaters enjoyed the apres skating. We stayed at the Droom and Daad and had wonderful food each day. Wow, What an honour, I have received my first award from Stephanie at My Calico Heart. Thank you very much Stephanie for The Marie Antoinette Award, a real person-a real award! It was really great to receive as I love the movie, Marie Antoinette, depicting her life, Kirsten Dunst played the leading role. Click facts for some information about her life. Thanks Stephanie. I must choose people to pass the award on to...difficult task, so many inspirational and creative blogs in blogland. Please do not be offended if I do not include you. 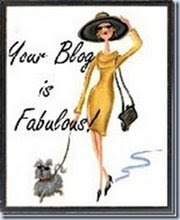 Thanks to all listed below for such wonderful blogs. While I was enjoying Sabina's Barefoot in the Orchard blog I was inspired to write the story and put up some photos of the work Mr Margie (Marc) has been doing for the last week, he has not worked in this area for eight years. Mr. Margie has agreed to be part of a team at a farm owned by one of his friends. There are four men on the team and they are all cutting Christmas trees. The trees were planted eight or nine years ago on the farm about half an hour from where we live. All the trees (Nordman and Noble Fir)are colour graded and have been specially pruned each year to have the perfect shape for the Christmas market in Denmark, Belgium, Holland, Germany and Ireland. The soil in the river valley where they grow is the best soil in Europe for the trees and the root stock is of a certain provenance that grows fast and full. The farm has a replanting programme and treat the Christmas trees as a crop. The farm is full of wildlife and each morning before the cutting starts there are at least two dozen wild deer from the Wicklow mountains grazing in the fields. The farm is home to many decidious trees and an abundance of wildlife, pheasants, rabbits, hares, even quail. The owner has also dug a lake on his land, and stocked it with fish. The lake is now home to ducks, water hens, herons and swans. Mr. Margie is obsessed with chainsaws. He is also obsessed with a challenge, and this work allows him enjoy both obsessions. Each day this week (he worked six) he has felled up to one thousand nine hundred, yes 1900 trees each day. That adds up to some serious bending each day. The target is 33,000 trees this year. When all the trees are cut in the field, some fields have 5000 trees they are then netted by another team and brought to the yard where the different grades are packed into trucks and transported to the ferry. All the fields will be harvested and the trees out of the yard by the end of November. Mr. Margie is usually still sick at the sight of Christmas trees by December 25th. It will take coaxing and a few glasses of mulled wine to get him to go back to the farm with the family to choose our indoor tree this year. We have four rooted outdoor Christmas trees in the garden. But the indoor tree is always a cut tree due to the heat coming off the stoves during the holidays. I love the smell of the tree in the house. It is offically ok to drink mulled wine now according to Lotta at My Lovely Christmas Home. I love thrift and charity shops and spend hours in them. A few years ago there was a really big one in Carlow. I bought these Crinolene lady embroidery squares from there one afternoon. The shop is no longer in business. This sampler is so nice and I am not sure if it was made on the date or if it was made afterwards. If it is original then this would be antique. Roxdorf appears in a history of Berlin from that era. These two pillow covers were from my husbands grandmother, and are so nice to sleep on, I also have the sheets to match. There is nothing quite like laying your head on freshly starched pillow covers. Another charity store find with these fantastic button covers. Do you have an interest in or passion for vintage cloth or embroidery?